The last week was held in Barcelona the NoConName security conference, and I had the pleasure of attending to give a security conference about Android. It talked about how to perform a dynamic analysis, static and forensic skip protection and release application along with our friend of MalwareIntelligence too, Ehooo, a small PoC reveals a vulnerability of Tap-Jacking. When analyzing any application on the Android platform, we must clearly distinguish between static and dynamic analysis. As the first study level application code to understand the workings of it and study the features it has, and the second based on the behavior that once executed the application in order to study the connections established with network. For each of them will be necessary to use a different set of tools that vary according to our purpose. · Dex2jar - Allows to convert class files to *. dex files *. jar to be later rotten abierto y editaros specific IDE for them to work it. · Jd-gui - Load *.jar files and it lets you view them in code java classes that you componen. · JAD - Turn them files to *. class *.JAD files with the intention of subsequently being loaded onto it su Understand for analysis. · Dexdump - tools included it in the Android SDK that it allows all code desensamblar it the file *.dex Dalvik Bytecode. · Understand - Excellent tool to analyze, disseminate, and review the operation and the flow of calls made ​​between the various methods that have been declared in the application source code. · Axml2print - Learn To clear it AndroidManifest.xml. 1. Create a virtual machine making use of the SDK. 6. Rely on Wireshark to analyze the connections made. (1) The fact of throwing events on the device is because on occasion some applications or malware to occur need special circumstances to be operational. See the receipt/sending an SMS, an incoming call from a phone number, etc. · Dex2Jar / JAD - To perform code transformations needed. · Understand - To make a static analysis of code and get the flow charts of the functions that make up the application. · Wireshark - To perform the dynamic analysis of the application and see the connections you make. To perform a correlation of the file system is necessary to have root permissions on the device, this can be achieved thanks to various exploits or applications that can be found without too much difficulty, and an explanation of their proper use. And in case you have an SD card, can be found in /sdcard. So the process will be as trivial as the files you want to bring us back to our work environment for further analysis. 6. Install the application and enjoy. So that with a simple and easy step will automatically perform all steps of the manual method. The vulnerability is found and exploited due to the trust model that is available Android applications, allowing certain permissions to open dialogues with the user, so that it can make decisions that the application itself can not. A malicious application that exploits this vulnerability can open a dialogue TapJacking privileges and place an opaque layer above this happens all the screen events to the layer directly below. Getting in this way to make calls, send messages, clicks on ads, banking, all while the user is not aware of it. The ruling was achieved following the Toasts, special kinds of dialogues, which unlike the "Activities" allowed overlaps the current activity of the application while this screen events were passed to lower layers. These principles have a look that distinguishes the normal dialogue, could be modified in size and behavior, as you can see in the video that is uploaded. · CallPayload.java – Make phone calls to the number indicated. · MarketPayload.java – Download and install applications on the market. · ResetPayload.java – Returns to factory phone. · SMSPayload.java – Send a text message back to us. · Main.java – Run the main service and cargo payloads. · MalwarePayload.java – Internal abstraction to facilitate the implementation of new payloads. · MalwareService.java – Creates toast e process starts tap-jacking. · Main.xml – Does the layout of the application, launching with an onClick event each payload. · Strings.xml – Contains the strings that are used in the application. In the issue of protection of applications, does the developer's fault for not taking adequate protective measures, or Google is to blame for having a system as 'infallible'? 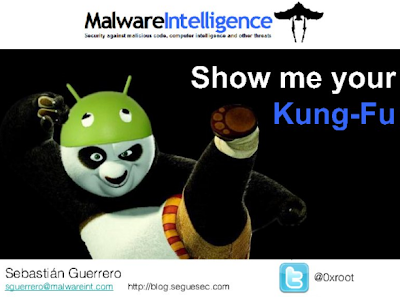 Google is concerned to fight against Malware? Or is it a battle that is lost from the start? Is it necessary to keep learning new versions instead of correcting errors in the previous there? We promote the progress of the platform, versions or fragmentation inevitable? Do you have to protect our data? Can we rely on the protection offered by Google? Nearest Compensates have our digital life knowing the danger we run?